My friend Jenni posted this cartoon on the Book of Face this afternoon. 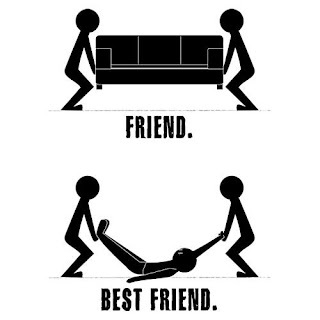 Friends help you move. Best Friends help you move bodies! It got me thinking about a way to finance my retirement. I think I'll open up a campground. Remember the old KOA camps that were all over the place? Mine will be kind of like that, only with much fewer amenities. I'm going to call it the DOA Campground. I'll buy a sizable plot of land somewhere out in East Texas, deep in the Piney Woods. Primitive camping. No water, no electric, not even a long-drop outhouse. You can show up whenever you want. No need to speak to anyone, just place an envelope with your entrance fee ($5000 per night) in the dropbox by the front gate, receive your gate key and map, then follow the map to your campsite. The campsite is rough, just a clearing in the woods big enough to turn your car around and, if you're so inclined, pitch a tent and build a fire. Feel the call of nature? We'll dig you a trench. Using a backhoe. It'll be 6 foot long, 6 foot deep, and 3 foot wide. We'll park the backhoe nearby, and leave a bag of quicklime in the scoop. Dump whatever sewage or other waste you might have in your trunk or van into the trench. We'll leave the keys in the backhoe. Just fill in the trench before you leave. And there you have it! DOA Campground!! The ice machine in the fridge has been on the fritz for some time. I usually get a bag of ice every week or so just to make sure there's a supply on hand. Ditto for soft drinks. Don't keep a lot on hand, just a six pack or so, maybe a bottle or two of spring water. Got home Friday night, and felt like crap. Decided to become one with the bed for much of the weekend. Got up every few hours for the usual purposes. Blew through all the bottled water, including the 1/3 of a gallon jug of spring water that had been rusticating in the back of the fridge since early March. Wake up from a nap at 10 pm Sunday, and I'm absolutely parched. Of course, there's nothing in the fridge. No ice, no water, no soda. Not even any beer. But wait... there, behind the bottle of mayo! Could it be??? Yes, it was... a lone bottle of tonic water. The bottle of RealLime also held a full measure. Excavating in the back of the freezer found two of those silicone ice molds that make 2" spheres of ice. I'd filled them, and forgotten them. I even had some Bombay Sapphire on hand. I don't know that I'd recommend a jumbo G&T for a late-night thirst quencher, but it beats the hell out of tap water.